Cat love card for Valentine’s Day or other occasion. 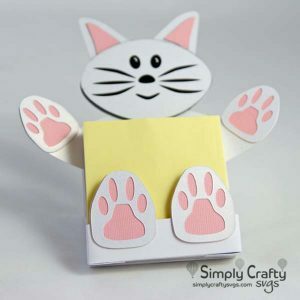 Use the Cat Love Box Card SVG File to make a cute card for cat lover. This can be used for Valentine’s Day or just because. Replace the included front love sentiment with your own message. 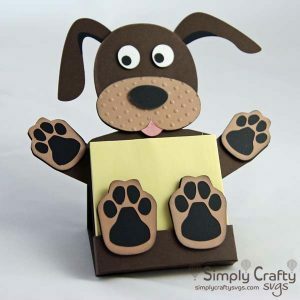 Included is also a back panel to add to the back to add a personalized message and/or sign the card. Box cards are fun, as they fold flat to send easily, but can be displayed easily upright. Card folds flat to 5″ x 6.4″. It will fit in a A7 envelope. If you do not have one, make one with our FREE Basic Envelope Set. Add rhinestone, pearl or enamel dots to dress up bottom panel. Emboss the panels for additional texture. This is a digital file, not a physical product. Upon checkout, you will be granted access to download the SVG file in ZIP format. PDF file included for file reference only. See video for assembly. File includes SVGs with solid scorelines for compatible die cutting machines (i.e. Cricut Explore series and Sizzix eClip2).